Color(s): Yellow, fawn, brown, russet; all shades of brindle. The South African Boerboel is the only South African dog specifically bred for guarding and protecting without being aggressive. Dating back to 1652, this breed is a descendant of the Boer dog. In the 20th century, the Boerboel was nearly extinct. They were revived, and are steadily gaining in worldwide popularity with dogs being exported and bred in Australia, Europe, Scandinavia, Asia, Russia, and the U.S.A. This powerful and large breed possesses an even character and keen intuition. It is the keen intuition that enables the South African Boerboel to sense what their human companion is thinking and feeling. They are intelligent, strong, muscular, imposing, and impressive. The South African Boerboel is not recommended for inexperienced or first time dog owners. This breed will do okay with other dogs, cats, and other household pets. They are calm, loving, intelligent, and obedient. They are extremely affectionate with children and make excellent playmates. The South African Boerboel is fearless, confident, and highly protective of their family, home, and territory. This breed is sensitive and will only act aggressively upon danger if they detect hostile intentions or are asked to do so. The South African Boerboel requires regular brushing to remove loose and dead hair. Bathing should be done when necessary. This breed has no health issues due to careful and selective breeding. The South African Boerboel's coat is smooth, dense, and short. This breed is an average shedder. 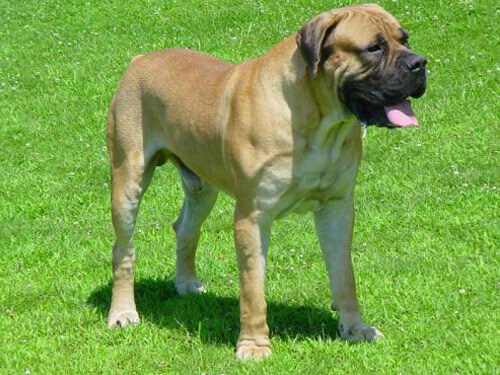 The South African Boerboel requires a dominant owner. Obedience training is absolutely crucial. This breed will not respond to harsh or heavy-handed training methods. South African Boerboel's require respect, firmness, and consistency. The South African Boerboel breed is not recommended for apartment living. They do best with a large securely fenced yard. They should never be left alone or unsupervised when outside. The South African Boerboel thrives on family play time and securely leashed walks.